We are delighted to announce that two of our team members Dr. Keivan Zokaei and Prof. Peter Hines have become the most recent recipients of the Shingo Prize for the Research and Professional Publication Award per the recommendation of The Shingo Board of Examiners, for their latest publication “Creating a Lean and Green Business System: Techniques for Improving Profits and Sustainability” co-authored with Hunter Lovins and Andy Wood. Aiming For The Shingo Prize? S A Partners are running Shingo Prize Training workshops for Discover Excellence around Europe and Australia and have several workshops planned through to the end of the year. View the European Shingo Discover Excellence workshop details and dates. View the Australian Shingo Discover Excellence workshop details and dates. 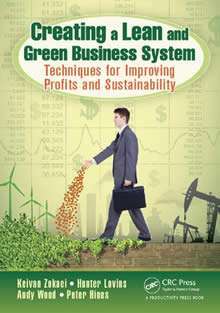 Creating a Lean and Green Business System: Techniques for Improving Profits and Sustainability offers opportunities for innovation that can simultaneously reduce dependence on natural resources and enhance global prosperity. It explores less understood aspects of lean and green – discussing their evolution independently as well as the opportunities that exist in their integration, highlighting the importance of a cultural shift across the whole company. Outlining a systematic way to eliminate harmful waste while generating green value.